Is purple a colour that you would associate with boys or girls? Or both? and I had specifically made this one to be unisex, if not just for boys (I had just done the Russian Doll series for girls and wanted to balance it out). A few customers have also asked for a blue background so I get it, the purple is not popular. But back to the original question..
Would you buy purple (anything) for a boy. Chris (my husband) says no, purple is for girls only and if I think about it, our boys don't wear a lot of purple but do have it in the pictures on their walls. I would be fascinated to find out what people think. I might post a poll on the blog soon. 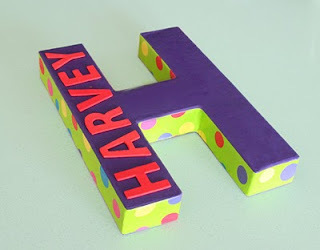 I saw these block papier mache letters and fell in love with them. I know that wooden letters that hang on the wall are the rage now, but I really like the deep edges on these which give them a 3D impact. Basically I buy the papier mache letter pre-made and paint & attach names etc. 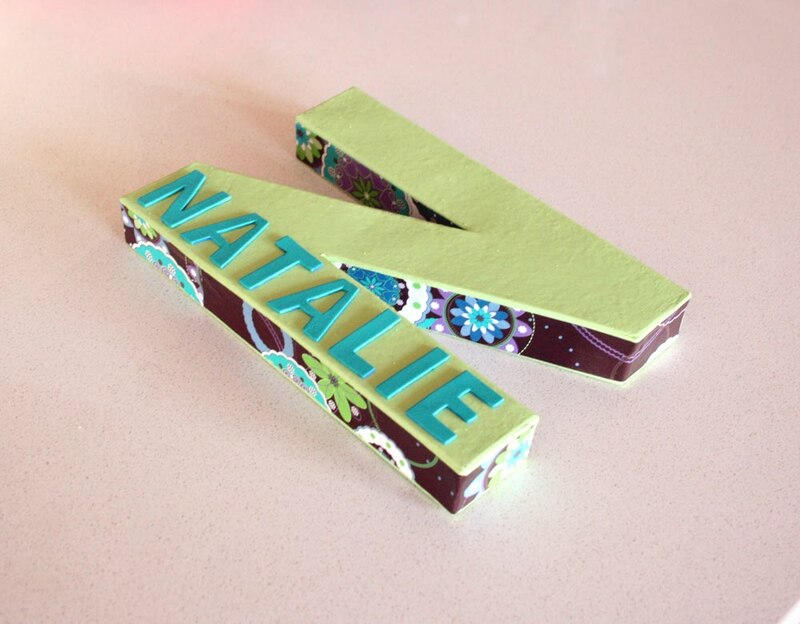 Not a huge profit margin on them as the letters are quite expensive but they are fun to make and I love choosing new designs and colours. I do struggle to think of names to go on the letters though (no wonder we struggled to decide on names for our boys). I have also tried to make a couple of ones for boys too. What does everyone think? I haven't sold any yet so might have to slow down on the production so that I don't get carried away. 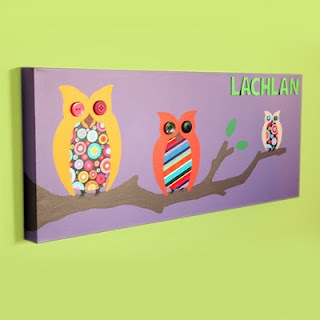 Here you will find a range of ideas, creations, tutorials and artwork from a creative-minded mother of 2. If I have done it, and am proud of it, and think you might like it too, you will find it here. I am an Australian artist with a very distinct style. 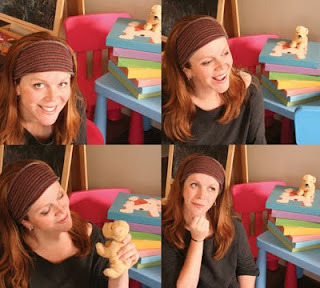 WallFry was born from my search for nursery art when pregnant with my first son. We were living overseas at the time and nursery art was scarce. I wanted something that was colorful and appealing to a child, while remaining stylish to adult eyes. I wanted something that could grow with him and I wouldn't have to throw it out when he turned 5. The art at WallFry is appealing to babies and older children alike. I have an 8 year old niece who visits often. She always asks to 'look at my shop' and we turn on the computer and spend ages looking at all the different animals and artwork and she tells me her favorites (which change every time). My own son would lie on the change table as a baby and smile at his 'animals'. Over time he would point, make the animal noises and eventually say their names (which he still does at 2 1/2). 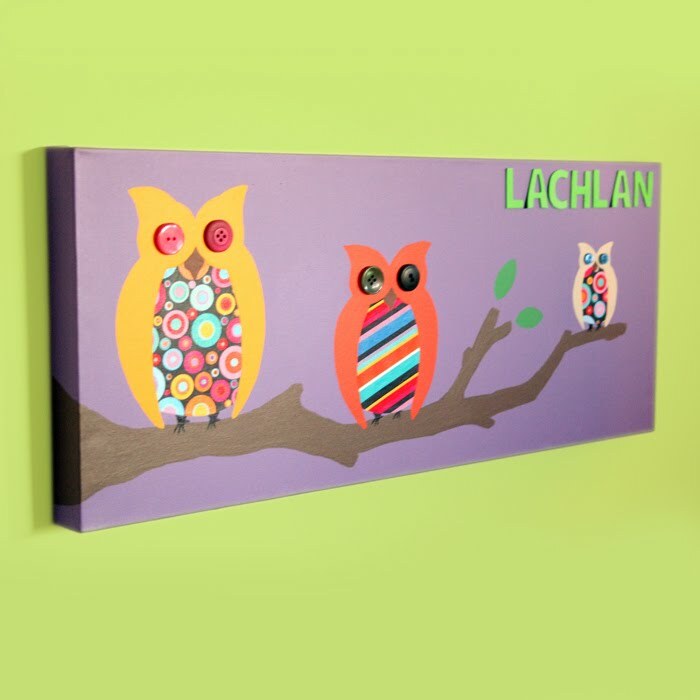 I love what I do, I love creating artwork that will brighten children's spaces, that they will love and that parents will also enjoy. I am a strong believer that there is nothing I can't do! I tackle every creative challenge with energy and humour and the results are....... varied. I created this blog to share them with you. I am very open to any questions or queries and am very PR friendly! I would love to hear from you.